Traditional styled watering can made from strong metal with folding handle. Powder coated for long-life. Holds 4.5 litres (1 gallon). These traditional galvanised watering cans are hand made in Great Britain. 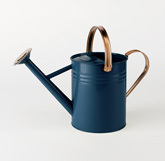 This metal watering can is top quality, manufactured to last. This large watering can has a brass screw on rose. This steel watering can is galvanised for long life and durability. This garden watering can has a water capacity of 2 gallon (10 litres). These traditional galvanised watering cans are hand made in Great Britain. This metal watering can is top quality, manufactured to last. This large watering can has a brass screw on rose. This steel watering can is galvanised for long life and durability. This garden watering can has a water capacity of 3 gallon.